The Back Terrace. Oil on Board, 25cm x 35cm. Zinnia flowers are the lazy gardeners best friend. Last year I started off with just a few and this summer they had grown everywhere, a forest of colours attracting so many butterflies and hummingbird hawk-moths. They are late summers last burst of sunshine and even though autumn is here the sun is still shining on this terrace! 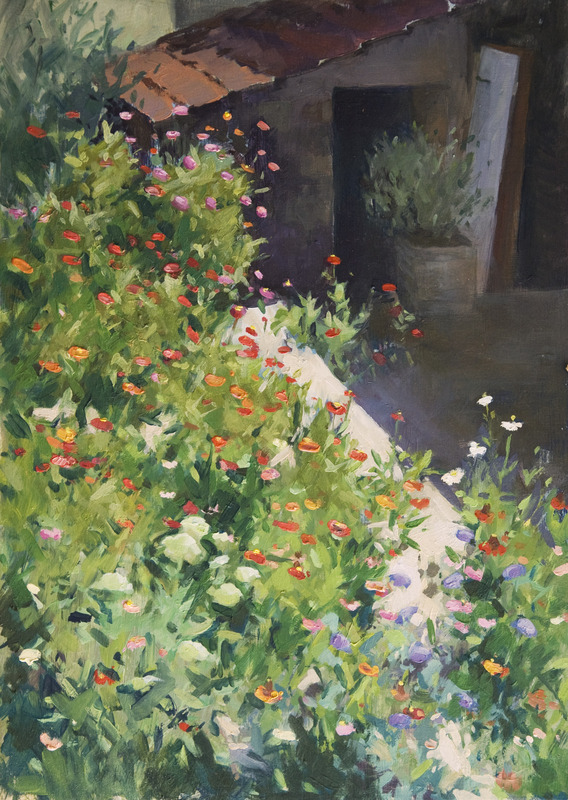 What struck me to paint this scene was the way that the brightly coloured flowers light up against the dark background which I think helps to break up some of the bushy leafy greens. After a bit of experimenting to get the flowers to jump out I decided to dull down and darken the green leaves while using different variations of colour, value and chroma to keep the green interesting. To express the brightness of the flowers which bring a bit of excitement into an otherwise big area of green I tried to keep the reds as saturated as possible, paint does not come close to real life’s value range and it is suprising how colours in nature are brighter than the colours you can make on the palette! Nice work! I love the warm sun on the roof too! Thankyou Kevin for stopping by! I wish I could paint foliage like that ! Thankyou Greti for stopping by! Oh, this is such an inviting scene! What a wonderful place you have. You did great on the garden, but I can’t keep my eyes off the tiled roof. So, so beautifully made. I’ll have to blame my profession for that. Thankyou Rita, i’m looking forward to seeing how many will grow again next year! Thankyou Priyanka! Have a good day! Previous Previous post: Painting in the Valdettaro Boatyard.